Also see interviews by Kristi Hansen Onkka: Virtual Reality Exposure Therapy and by news reporter Kristen V. Brown: Virtual Reality to Treat Phobias. An interview by freelance journalest Eva Schram published in the January 2017 issue of Psychologie Magazine. Dr. McMahon is a frequent speaker about Virtual Reality Therapy and has taught continuing education workshops to psychologists at the American Psychological Association and the California Psychological Association conventions. See other stories about overcoming fears with Virtual Reality Exposure Therapy (VRET) and cognitive-behavioral therapy (CBT). She uses VR software by www.psious.com and was an early adopter and beta tester. She is on the Advisory Board of Limbix which creates VR videos for psychotherapy. See the New York Times article. Hear her panel presentation about "Healing with VR" on youtube: https://youtu.be/VX4xbhTUbK8 at timepoints 8:51, 17:19, 23:55, 31:38, 38:15, 52:55, 1:01, 1:03, and 1:15-1:16:40. Computer software allows you to “face” your fears gradually and safely with therapist support and guidance in the office. Appropriate sounds make the experience more real. Your point of view changes as you move your head and look around. 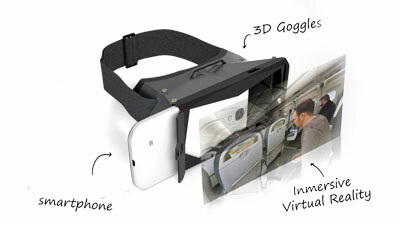 Fly on a “virtual plane”. Drive a “virtual car” in the city, through a tunnel, over a bridge, or on the highway. Interview or present to a “virtual audience”. And so on. Virtual environments are available for fears of flying, driving, public speaking, job interviews, heights, elevators, enclosed spaces, BART, open spaces, needles, and insects. Simulated virtual environments for relaxation are available as well. Simulations are safe, controlled by the therapist, and can be stopped at any time. Together, you and your therapist select the virtual environments and experiences that will be most helpful for you depending on your fear and your stage of treatment. For example, someone with fear of flying can experience preparing to leave, going to the airport, waiting and boarding, sitting on the airplane, looking out the window, and hearing the pilot’s announcements. Specific aspects of flying that trigger fear—such as takeoff, landing, rain, or turbulence—can be experienced safely and repeatedly under the therapist’s control. Cognitive behavioral therapy is one of the fastest and most effective treatments for anxiety and fears. You learn powerful anxiety management skills. Virtual reality helps you become less sensitive to stressful situations by experiencing them repeatedly while using anxiety reduction skills and learning new ways of thinking. By “facing” your fear in virtual reality using these skills and overcoming your fear, you are prepared to successfully overcome those fears in real life. Although virtual reality technology is part of this process, the therapy is not automated. Effective treatment requires an experienced therapist and Dr McMahon has been treating anxiety and fear for over 30 years. Fear of Public Speaking addressing varying size audiences from small, medium, large and TED talk-style. See Anxiety Treatment for more information on treatments for specific fears. Although some VRT technology is relatively new, cognitive behavioral therapy (CBT) for fears and anxiety is an established treatment method with extensive evidence of effectiveness. Research on adding VR simulation to the exposure portion of CBT shows clear benefits. Facing fears using simulation was found to be as, or more, effective as facing fears in real life. Read the Wall Street Journal article on Virtual Reality as a Therapy Tool. Dr. McMahon has been using virtual reality therapy to help clients since 2010. While she was working for Kaiser Permanente Medical Group, she received an innovation award for introducing VRT, documenting its effectiveness, and training other therapists on effective use of this technology. Her work was profiled in the San Jose Mercury News and on local television. Call Dr. McMahon at 1-415-625-3565 to arrange an appointment.